"So sorry for your loss. May your hearts find comfort in the..."
Norma Lee Caldwell was born on February 1, 1925, to Gail Rice and Louise Burkhart Rice in Erie, KS. Mass of Christian Burial will be held at 10:00 a.m. Thursday, December 20, 2018 at St. Ambrose Catholic Church, 519 N. Main Street, Erie, KS 66733. Burial will follow at East Hill Cemetery in Erie, KS. As a young girl, Norma enjoyed dance, tennis, and music. Her violin was passed down, and two more generations developed the love of music. In high school, she lettered in theatre. 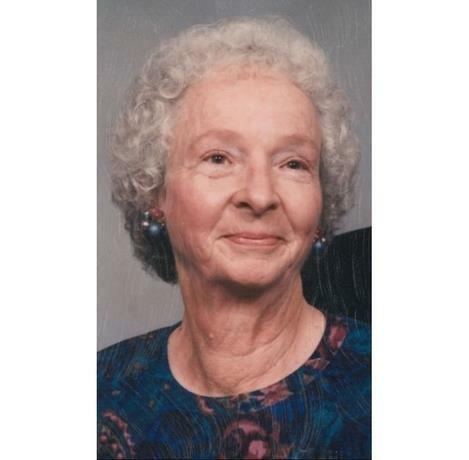 She graduated from Erie High School in 1942, and attended Chanute Junior College, studying Home Economics. She worked in the California Ship Yard in Long Beach, CA, in 1943 and 1944, as an administrator for building the troop carrier which her brother, L.G. Rice, was training for as a seaman. Norma married Robert D. Caldwell, also of Erie, on January 28, 1945, in Erie, KS, at St. Ambrose Catholic Church. The two of them lived in Hobbs, NM, while Robert was in bomber pilot training. They lived in Auburn, AL, Bartlesville, OK, Coffeyville, KS, and 35 years in Pittsburg, KS. They moved to Lawrence in 1995, and lived at Brandon Woods retirement village, where she was a member of Corpus Christie Catholic Church, and lived her faith her entire life. In 2017, she moved to The Piper Assisted Living, in Kansas City, KS. Norma had a great passion for gardening and growing flowers. Big bouquets of cut flowers and green potted plants brought her great joy. All three of her children, and two of their spouses, graduated from Kansas State University, and she became a KSU sports fanatic. Norma watched every KSU football and basketball game available on television, cheering them on and sometimes giving her opinion on the opposing coaches. She was proceeded in death by her husband, Robert, her brother, L.G., and her parents. Survivors include two daughters, Carol (Harold) Vandeventer, Manhattan, KS; Leah (Bill) Brown, Basehor, KS; and son Lorey (Paula Fleming) Caldwell, Youngstown, OH; four grandchildren, Daniel (Nicole) Caldwell, Mathew (Alison) Caldwell, Chase and Spencer Brown, and four great-grandchildren from Youngstown OH, Zachary, Alexander, Madison Mae, and Siena.